My name is Dan Langston and I am a staff writer for a large northeastern newspaper. I was selected to write this book from more than three thousand professional writers who competed for this privilege. Why did we all want this job so badly? It was because one of the richest men in the world had agreed to share his secrets for building personal wealth though this book. For me the motivation was simple, I was the world’s worst at handling money. I felt that maybe if I got the job some of his knowledge might rub off during the interviews. I mean maybe he could actually teach me how to do more than just spend every dime I earn when I earned it. In my wildest dreams I could never have imagined what an understatement that would turn out to be. Before I go much further, let me back up and tell you how all this came about. It all started a little over a year ago on a tiny island in the North Pacific called Kiki Loa. 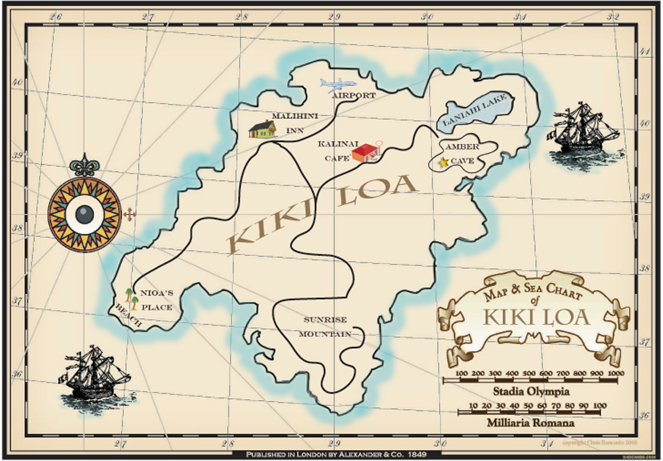 Kiki Loa is located approximately 1700 miles due west from the Hawaiian island of Maui. Kiki Loa is one of the most beautiful islands in the world. It is 6 miles wide at its widest point and a little over 12 miles long. The beaches are some of the most spectacular I have ever seen. The whole southern side of the island is a mountain that comes jutting straight up out of the ocean. It looks just like the volcano drawings from my daughter’s second grade science book. But the sunsets are what really make Kiki Loa one of the world’s true vacation treasure spots. Six out of every seven days a year you can stand anywhere along the west beach of the island and see the most phenomenal sunsets you have ever seen in your life. I mean splashes of red, magenta, orange, pink, gold and purple on the backdrop of a darkening sky. And if you are really lucky you might see what the islanders call “Okue Milahi Aloahia” which means “The Giant Green Flash.” Okue Milahi Aloahia is a phenomenon that occurs when the sky is crystal clear at the exact moment of the sunset. In order to see Okue Milahi Aloahia, you have to stare at where the sun meets the ocean during the sunset. If you are lucky and don’t blink, at the precise second the top of the sun disappears below the water you will see the most brilliant flash of green light you can imagine. It is truly exhilarating. Unfortunately, the island of Kiki Loa is very poor and its limited residents rely on farming as their primary source of income. Forty-nine out of fifty islanders are farmers with the principal crop being sugar cane. Working the sugar cane fields is a very difficult life for the farmers and things have been getting progressively worse because the price for sugar cane keeps falling. This happened once they began growing sugar beets back in the states using more productive farming techniques. The remaining one out of fifty islanders works in the island’s tourism trade, which is extremely meager to put it politely. Tourism should have been big business for Kiki Loa, but unfortunately there are no large hotels to attract the volume of tourists needed to support the island. All Kiki Loa had was a few small Bed and Breakfast Inns that attracted a hand full of adventurous tourists who were willing to come to a small remote island not really knowing what they would find once they got there. About a year ago, a very large hotel corporation came to Kiki Loa to investigate building a world class resort. Obviously, the island was bubbling with excitement. This would mean the islanders could give up their torturous lifestyle of working the sugar cane fields and have a chance for their children to have a brighter future. Everyone was dreaming about how wonderful it would be if the hotel chain decided to build on Kiki Loa. The hotel’s site evaluation team was amazed at the island’s natural beauty. It seemed to have it all: lush rain forests, spectacular scenery, fantastic snorkeling or scuba diving in the aqua colored reefs of the island’s northeast corner, and of course, the magnificent Kiki Loa white sandy beaches with their remarkable sunsets. The team found everything perfect except one thing; the island did not have a large enough fresh water supply to support the size project the hotel company wanted to build. The site evaluation team returned to their corporate offices in an attempt to make the project work. However, no matter how hard they tried they could not justify the extra $15 million it would take to build the fresh water desalinization plant required to support the hotel project. After several months of eager anticipation, the tiny island of Kiki Loa was informed that unless it could commit to build its own desalinization plant within 60 days, the hotel would choose another island for the project. The entire island was devastated. This was their ticket to a brighter future, a future in which their children could prosper and have a better life. Everyone was talking about the problem and trying to come up with a solution. Day after day the talks continued. As the sixty day deadline neared a great weight seemed to settle over the entire island as its people finally accepted the reality that their dream was about to vanish. Then two days before the deadline the most amazing thing happened. Akamai Kane, the island’s only taxi driver, came forth and wrote a personal check for $15,000,000 to pay for the water plant. At first people thought that he was playing a joke trying to lighten up a sad situation. After all, he was such a good-natured old gentleman and always seemed to know what to do. Besides, how could a cab driver afford to write a check for $15 million? But to everyone’s amazement, they soon found out that the check was good; and so began the most fantastic story I have ever reported. I won’t bore you with the details, but it was soon discovered that Akamai Kane was one of the richest men in the world and nobody knew it. What was even more puzzling was how he could have done it. He was a native Kiki Loaean; the birth records proved that. Nobody on Kiki Loa had ever had any real money; so the questioned remained, “How did he do it?” This became the question to which everybody wanted an answer. 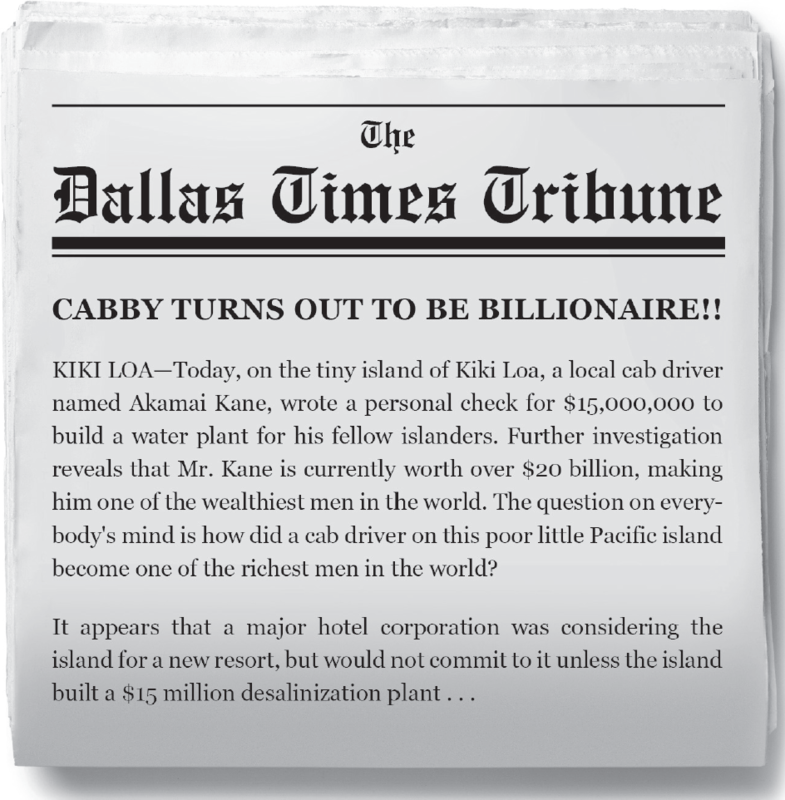 Kiki Loa– Today, on the tiny island of Kiki Loa, a local cab driver named Akamai Kane, wrote a personal check for $15,000,000 to build a water plant for his fellow islanders. Further investigation reveals that Mr. Kane is currently worth over $20 billion, making him one of the wealthiest men in the world. The question on everybody’s mind is how did a cab driver on this poor little Pacific island become one of the richest men in the world? It appears that a major hotel corporation was considering the island for a new resort, but would not commit to it unless the island built a $15 million desalinization plant . 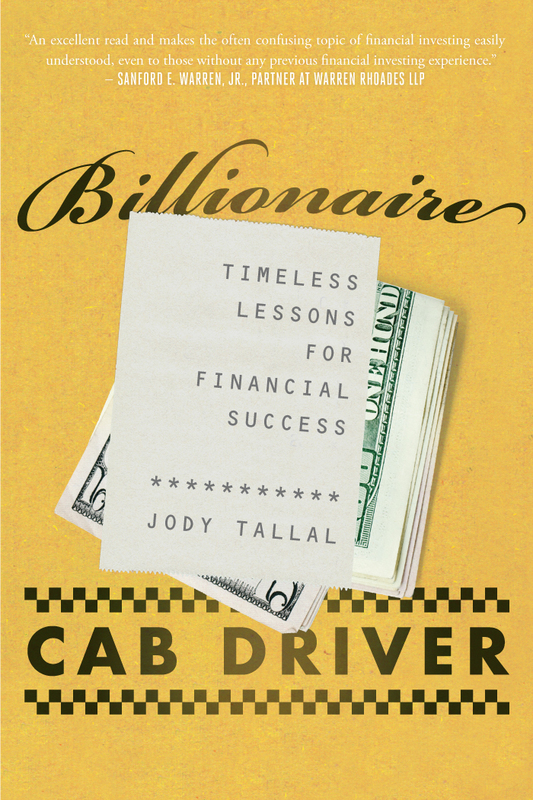 . .
How did a cab driver get $20 billion? I couldn’t believe it! I immediately grabbed the phone and got an international operator. What I found out over the next two days was that it was impossible to reach Akamai Kane. It soon became apparent that I wasn’t the only journalist that wanted an answer to that question. During the next week I tried everything, but without success. Mr. Kane was refusing any kind of interview. I guess I really can’t blame the guy; just about every reporter in the world must have been trying to talk to him. Then a spokesperson for Mr. Kane announced that he was flattered by all the attention and everyone’s interest, but that he didn’t want to spend all his time answering the same questions repeatedly. As a solution, he said that he had decided to let one journalist, whom he would select from applications submitted, write his life’s story. To enter the selection process, the journalist should submit, in their own opinion, their finest work. I made up my mind at that very moment I wanted to be the one who told Akamai Kane’s personal story. In fact, it surprised me just how much I wanted this. I wanted to be selected by Mr. Kane more than anything I have ever wanted in my life. I instantly knew which piece I was going to submit. It wasn’t either of the two war stories for which I have received my highest recognition. It was a story I wrote very early in my career, when I was still reporting for the Boise Tribune. The story was about a small farming community outside Boise, Idaho that was crippled by the drought of ’82’. The crops were already severely damaged when the rains finally came. However, during the rainstorm lightning struck one of the farmer’s homes and it burned to the ground. Those farmers worked all day long trying to save what they could of their crops, and then took shifts each evening, as they all chipped in together to rebuild their neighbor’s home. It was a remarkable story about the strength and security that comes from being a community. It reminded me of something straight out of the 1800’s. That story didn’t win me any awards, but it did get me my current job. I carefully packaged that story along with a very personal letter to Mr. Kale in which I sincerely shared my intense desire to be selected. I had a tough time trying to decide if my cover letter should state my true feelings or contain something clever, chocked full of wit, to display my writing style. I was afraid that he might think my real motives were too selfish or dumb, but in the end I decided that honesty is the best policy. Seven weeks went by and I had just about concluded that someone else must have gotten the job. Then one day while I was sitting at my desk the phone rang and it was Mr. Kane himself. He said he had just one question for me to answer; “Was I serious when I said in my letter to him that I wanted to be selected more than anything else that I have ever wanted in my life?” I assured him how very serious I was where upon he said “Mr. Langston, you have the job. Will you please come to Kiki Loa at your earliest convenience?” I was shocked and said “Sure, I’ll be there tomorrow and,” where upon he politely cut in and said “Thank you Mr. Langston. I look forward to meeting with you in person. Good bye.” Then he hung up. I was dumbfounded. I had just been selected from over three thousand of the top writers in the world, all who had competed hard for this story. I realized then that I was no longer sitting; I must have instinctively stood up when I realized who was on the phone. I shook my head to make sure I wasn’t dreaming and then grabbed my chair and yanked it under me just as my legs gave way. I collapsed in the chair, out of breath and experiencing the most incredible adrenaline rush of my life. I didn’t move again for what seemed like an hour. The next morning I left at 5:45am on the first flight out for San Francisco, which connected with another flight to Hawaii. Because Kiki Loa was such a small island it had no commercial airliners serving it. Therefore, I had to charter a plane in Honolulu to get from there to Kiki Loa. I got there around 9:00pm and called for a taxi from the small airport to take me to the Malihini Hale, a small Inn on the island. To my surprise my taxi driver was none other than Akamai Kane himself. It was during the ride to the hotel that I learned that he had the only taxi cab on the island and the Malihini Hale was the only Inn. Akamai Kane was in his sixties and of Polynesian decent. He had bronze colored skin and large dark eyes with a head of jet black hair beginning to lightly streak with gray. He was a robust, but gentle, man who seemed to possess the secrets of youth. Being with him seemed more like being with a thirty-year old than with someone in his sixties. He possessed a quiet sort of energy and seemed to radiate a real enthusiasm about life. I can’t tell you why. I really didn’t know this man at all, but suddenly everything was immediately all right. I felt a strange calm inside, very peaceful and well grounded. All he had done was touch me on my shoulder and whisper a sentence in my ear; but somehow I instinctively knew if Mr. Kane said to trust him, I could.